Jawaharlal Nehru Tropical Botanic Garden and Research Institute, Palode, Kerala, INDIA. Introduction: Pellionia heyneana Wedd. Leaves have long been employed as a traditional remedy by the Cholanaikan tribe of South India to treat various ailments. Methods: Pharmacological and physicochemical evaluation of P. heyneana leaf has been carried out to determine its macro and microscopic characters, and also some of its quantitative characters as per standard procedures. 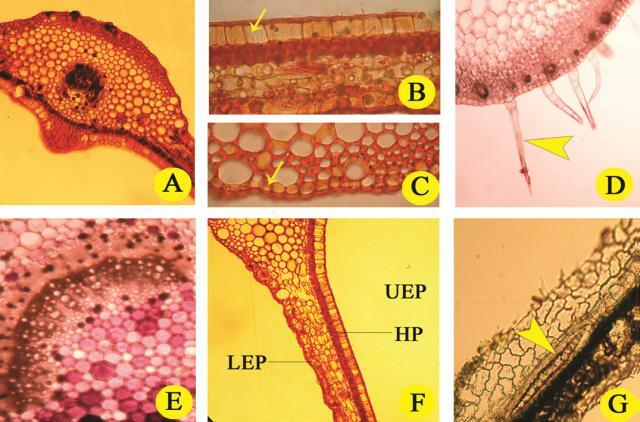 Results: The pharmacognostical evaluation of P. heyneana leaves revealed the presence of characteristic microscopic features of the crude drug like cystoliths in upper epidermis, helicocytic stomata in lower epidermis, large number of peculiar shaped, huge (200-400 μm) foliar sclereids, absence of palisade tissue in the lamina etc. Powder microscopy showed the presence of calcium oxalate crystals, stone cells, multicellular trichomes, resinous blocks, spiral vessels, xylem fibre, starch grains, simple fibre etc. Conclusions: All the parameters evaluated in the study will aid to identify the authenticity of P. heyneana leaf even from the crushed or powdered form. Keywords:Cholanaikan tribe, Fluorescence analysis, Helicocytic stomata, Pharmacognosy, Powder microscopy. V V,, PG L, AL AK, Nair RR, Rajasekharan S. Physicochemical Evaluation and Pharmacognostical Standardization of Pellionia heyneana Wedd. Leaf. Pharmacognosy Journal. 2016;8(6):551-556.